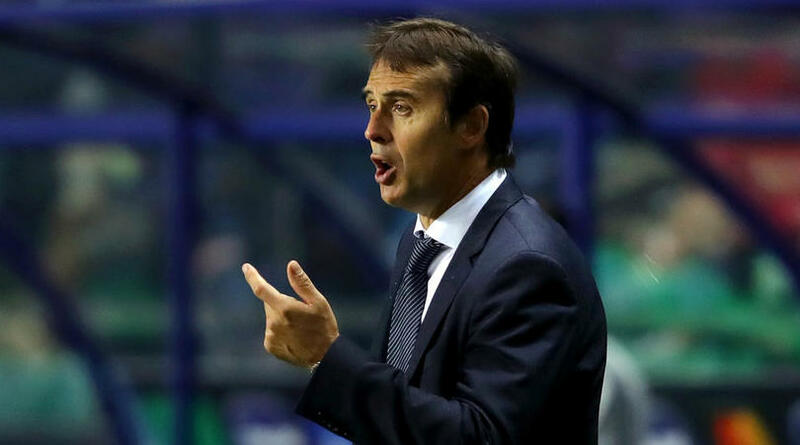 Julen Lopetegui admitted he does not know whether he will take charge of Real Madrid in the first Clasico of the season against Barcelona on Sunday. The 52-year-old saw his side bring their five-game winless streak to an end with a 2-1 victory over Viktoria Plzen in the Champions League on Tuesday but his position remains in jeopardy ahead of the trip to Camp Nou. Madrid sit seventh in La Liga after nine games this season, trailing leaders Barcelona by four points, but Lopetegui was in dogged mood after seeing off the Czech champions at the Santiago Bernabeu. When asked whether he would remain in his job come Sunday, he replied: “It is not for me to answer. ‘What I know is that we are thinking about and preparing for Sunday’s game. Karim Benzema’s first goal since September 1 gave Madrid an 11th-minute lead over Plzen and Marcelo doubled their advantage 10 minutes into the second half. But the home crowd groaned as Plzen pulled a goal back in the 78th minute through Patrik Hrosovsky to set up a nervous finish for the competition holders. Lopetegui, who opted for a front three of Isco, Benzema and Gareth Bale in his starting 11, said his forwards struggled on a night when victory was essential. ‘We didn’t close the game out by scoring more goals, but we had several chances,’ said the former Spain coach. ‘We wanted to win and play well and, at times, we deserved more. ‘It was a tough match and we had a hard time scoring, but we have to accept it.